GeoOp is an award-winning service providing a complete and reliable workforce management system for businesses. It is presented as a very efficient and time-saving solution that focuses primarily on allowing companies to improve their workflow capabilities. 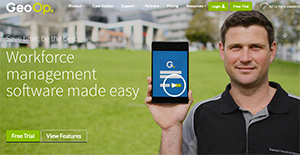 GeoOp was designed to be a simple and easy-to-use solution, yet the software is still very powerful thanks to a wide range of features that allow users to get all their workforce tasks done easily. It integrates well with a number of other software to provide a better workforce management experience. GeoOp provides an easy job management solution with an interface that works the way you want it to work. It is customizable and simple software that continuously evolves for a better experience. This software offers real-time features in scheduling and job status, allowing you to create or update information easily and instantly so staff are aware of whatever information you provide through GeoOp in real time. It also has tracking and mapping capabilities that allow you to check in various locations or for you to track others in your team to optimize resources. GeoOp also helps make work easier with its automated capabilities that does recurring tasks easily, as well as preparing quotes and invoices that the system does for you. In addition, it also has photo and video capabilities, allowing you to share rich media so your staff would know better what they are looking for. Every organization has different wants and needs a software that can be personalized for their size, kind of employees and customers, and the particular industry they are in. For these reasons, no platform can offer perfect tools out-of-the-box. When you try to find a software system, first be sure what you need it for. Read some GeoOp reviews and ask yourself do you need basic functionality or do you need complex tools? Are there any industry-specific tools that you are seeking? Obtain the answers to these questions to assist your search. There are plenty of elements that you need to reflect on and these include your finances, particular business wants, your organization size, integration needs etc. Take your time, use a few free trials, and finally select the platform that presents all that you want to boost your organization efficiency and productivity. How Much Does GeoOp Cost? GeoOp has five different pricing plans. There is also a 14-day free trial available that lets you test all key features of the software first. We realize that when you make a decision to buy Field Service Management Software - FSM it’s important not only to see how experts evaluate it in their reviews, but also to find out if the real people and companies that buy it are actually satisfied with the product. That’s why we’ve created our behavior-based Customer Satisfaction Algorithm™ that gathers customer reviews, comments and GeoOp reviews across a wide range of social media sites. The data is then presented in an easy to digest form showing how many people had positive and negative experience with GeoOp. With that information at hand you should be equipped to make an informed buying decision that you won’t regret. Where do I start! Appalling to say the least! We've been using Geoop for almost 3 years now, and it has literally changed the way we do business. What are GeoOp pricing details? What integrations are available for GeoOp? Pros: We utilize the product for scheduling, job tracking, and job documentation. I couldn't begin to count the number of times that we've avoided a major problem by having the ability to login and refer back to pictures taken of a job site several months prior. Cons: We don't utilize the invoicing module. I would love to at some point, but it just doesn't meet our current requirement. Pros: The idea of this program and what they claim in their marketing was the best aspect of this product, sadly they don't deliver. When you can actually use the search tools finding jobs makes it easier, however neither the date searches or any of the menu bar searches work anymore so the point is really moot. Cons: Everything really, no one in engineering team wants to help you unless you can prove with video evidence that something isn't working. You are continually ignored and at nearly $400 a month I would expect better service and actually people who know what they're doing. The idea of this program and what they claim in their marketing was the best aspect of this product, sadly they don't deliver. Ease of use and integration with accounting software. Easy to use on the road. Real time uploads makes it easier between staff on the road and the office. Pros: Live Job Tracking (tech notes, photos etc), Xero Integration, easy scheduling, cuts down on double handling. Cons: Some integrations not used to full potential, slight search function glitches. We’re a Mobile Appliance Repair company and before using GeoOp we operated on a paper based system that was extremely time consuming. The business was growing before our eyes and it was easy to see our current method of job tracking wasn’t working…Then we discovered GeoOp a subscription based Workforce management software that allowed us to monitor jobs live, with accurate data entry, photos, quoting/billing etc We’ve being using GeoOp for 3 years now and found it has improved work flow immensely. We use GeoOp on multiple platforms PC, Android and iOS all of which are well set out (iOS interface does have obvious differences to Android buy iOS users won’t be put off by them). The system does offer various integrations with other software eg Xero depending on the other software affects the usefulness of this feature, with our accounting software it’s been very effective at minimising double handling, however, we haven’t seen great advantage with the integration to our GPS Tracking Armada. Side note, more about the developers and programmers, they are extremely open to suggestions and have over the time we’ve been using the software taken these on board and made improvements where ever they can. Overall GeoOp is an effective job management software that improves work performance, cuts down on paper work and admin time. We’ve been using GeoOp for nearly 12 months now after a lengthy trial period to confirm it met our business needs. After exhaustive research on other work management apps GeoOps has been a successful decision, streamlining processes and workability for our field team. The integration with MYOB has now transitioned us away from manual admin tasks to a more automated “job in, job done, job out” environment. All GeoOp support queries are answered quickly with new efficiencies being developed and suggestions welcomed. I’ve been using GeoOp since 2014 replacing a previous job management system that was far more complex and as such wasn’t being used to full potential. GeoOp is far more straightforward and covers all the features I need for day to day job management and invoicing rather than overcomplicating the process with features I’ll never use. The Xero integration makes invoicing a breeze. Works well both on desktop and mobile. We have been using Geo-Op for over two years and very happy with it. The constant improvements with it have made it a great addition to our software fleet and its integration with Xero is very helpful. 3 years we have been using Geoop across all platforms, Android, Ipad an PC. All are easy to use and well set out. If an issue does arise with a new OS update, Geoop are quick to action any issues. One future need with our expanding business would be a parts inventory and or parts use listing, so we can reorder what parts have been used. Currently parts listings can be uploaded and charged out easily enough but a rocord of what has been used would be good. Been using GeoOp for 3.5 years now. It is great work tool that we use to manage our client base, schedule the mows, track our jobs, and invoice (linked to Xero). It works. It works really well for us and is completely integral to our business. I couldn’t imagine trying to function without it. We have a been using GeoOp for over 2 years. First and foremost GeoOp has an amazing staff. Our delivery needs were not very typical and the office manager worked with us. The GeoOp system provides more services than we ever could have imagined. GeoOp by far was the most comprehensive, easiest to learn and was offered across all platforms. GeoOp was also the best value by far. The GeoOp system has worked so well that some of the clients we deliver to have also become GeoOp clients. If your business needs to schedule, keep track of deliveries, take pictures of what was done. You would be crazy not to have GeoOp as one of your team members. We have over 15 licenses and some of the best clients in our field I truly believe this is in great part to the service we are able to offer with the GeoOp system. We have used GeoOp for about 18 months and haven’t turned back. It is very comprehensive for our Electrical Contracting business. Support is excellent, with great communication. Pricing is more expensive than other programs we investigated, but this was the right fit for our business. The only issue I have had is interfacing with MYOB as we use Mac. Other than that I would highly recommend. If you need more information about GeoOp or you simply have a question let us know what you need and we’ll forward your request directly to the vendor.